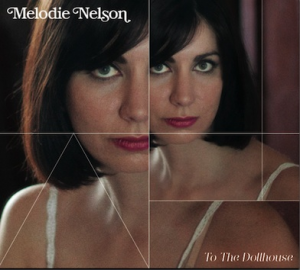 After the 2011 debut of Meditations On The Sun, Melodie Nelson is hand-delivering to us her follow-up album, To The Dollhouse. Melodie Nelson, the solo moniker of Lia Tsamoglou is no stranger to music. She has been playing the piano since she was seven, and began to develop her talent as a songwriter around nineteen years old. Tsamoglou can be credited for not only the penning of her songs, but also of some of the music too. ‘I tend to write a lot of the parts like the bass and the guitar and keyboards,’ she says. Tsamoglou took a break from song writing for a few years but decided that she would delve back in to it. And it seems to be working well for her with her second album boasting deep and seedy undertones of a ‘60s and early ‘70s sound while still setting a soft and dreamy, ethereal impression. Tsamoglou draws her musical inspiration from the sounds of the ‘60s and the likes of the Beach Boys, Nancy Sinatra, Lee Hazlewood and even the French singer, songwriter and poet, Serge Gainsbourg. In 1971 Serge Gainsbourg released a concept album called Histoire de Melody Nelson to which she loans credit. ‘Serge Gainsbourg is where the name ‘Melodie Nelson’ came from,’ she reveals. The first single off To the Dollhouse, Martha, is a soft, almost-delicate and vintage sounding melody, rich with hauntingly grim lyrics that tell a story of a murdered housewife. Tsamoglou highlights the comparison between her debut album, Meditations On The Sun and her current album, To The Dollhouse, citing that listeners can expect more song-written songs. ‘With the debut album, the songs had come more from ideas that were sort of loop-based songs, whereas on this album these songs are written songs, with verses and choruses,’ she says. This musician like a lot of others thinks of each of her songs as her own babies and finds it hard to choose just one as a favourite, but resonating more personally for Tsamoglou is the title track of her album. ‘To The Dollhouse is a really simple song and it didn’t take me as long to write it as some of the other ones, but I am really happy with how it turned out, it really takes a lot to sing it and perform it live,’ she explains. Tsamoglou finds a great deal of support in the sometimes-trying and competitive music industry, a lot of her friends finding great success also in the industry which she says can be a huge help. ‘I have a lot of friends who are doing really, really well and they’ve been awesome and supportive,’ she explains. She feels, like a lot of other Australian musicians, that there is a lot of talent that is left undiscovered by listeners who seem to flock more to larger scale concerts of international artists while overlooking a plethora of home grown music. Tsamoglou recognises the importance of getting noticed from overseas listeners that can map out the success for Australian artists, a fact that musicians could find ironic and also frustrating. ‘What we have here in Australia is such good quality, and if you get written about overseas, only then are you recognised here,’ she says. Though it’s not all bad. ‘I feel like it’s a great scene here and everyone has always been so lovely and supportive so I can never complain,’ Tsamoglou finishes with a hint of joy in her tone. To The Dollhouse is available on iTunes and at local music retailers. What a fantastic interview, well done! This entry was posted in Featured, Music and tagged melodie nelson, music, to the dollhouse. Bookmark the permalink.